Acupuncture most likely evolved out of early massage techniques. By touching and feeling the surface and tissues below the skin one can notice the changes that occur during cycles of health and illness. At this time the person was seen as a whole so the whole of the body would have been investigated irrespective of the nature and location of the problem.Through this kind of tactile exploration reactive points could be mapped out all over the body. 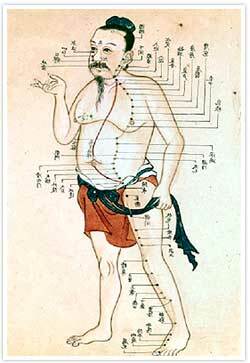 The earliest writings describe a system of channels which were treated with massage and moxibustion (heat therapy) and then later acupuncture. These channels can be seen as locations on the surface that reflect changes within the person’s interior. The channels were described much like a network of rivers; ensuring a flow of Qi (perhaps best thought of as vitality) and blood throughout the body, the purpose of which was to maintain the healthy functioning of the body/mind. When for whatever reason any of these channels become ‘blocked’ or imbalanced the body/mind is less able to regulate it self and becomes vulnerable to illness and fatigue. The job of the acupuncturist is to regulate the flow of Qi and Blood in the channel system, removing ‘blocks’ and promoting circulation. This is achieved through the use of a range of techniques, typically the ‘insertion’ of fine needles and/or the burning of a herb (moxibustion) over specific points around the body. Other techniques such as massage or cupping are also made use of. There is a huge variety of approaches that have evolved over time in terms of how many needles/points used, duration, shallow or deep insertion, non insertion, types of moxibustion, use of magnets or electro acupuncture etc. Generally the techniques have to be adapted to the individual and the aim of the traditionally trained practitioner is to not only alleviate the symptom, but to correct deeper imbalances of the channel system which are thought to have given rise to the problem. By making these subtle adjustments the treatment aims to bring about a more harmonious functioning of the body/mind leading to a greater sense of well being and improved health. When the body/mind is in a more coherent state it is then more able to fight illness, repair it self and protect it self against illness and fatigue.